A day after the Redmi Y1 and Redmi Y1 Lite hit the market, Panasonic has launched a budget smartphone -- named Eluga I5 -- in India. 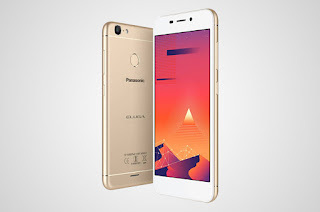 The Panasonic Eluga I5 price is Rs. 6,490 (MRP Rs. 8,990), and the handset will be available exclusively on Flipkart, in Black and Gold colour options. The e-commerce startup is offering exchange discount of up to Rs. 6,000 and additional 5 percent off on Axis Bank Buzz credit card payments with the Eluga I5. The Panasonic Eluga I5 has a 5-inch HD display with 720x1280 pixels resolution and 2.5D curved Asahi Dragontrail glass protection. It is powered by an octa-core MediaTek MT6737 chipset coupled with 2GB of RAM. The dual-SIM (Micro + Nano)handset has hybrid setup, and runs on Android Nougat 7.0 operating system. It has a 13-megapixel rear camera with five-piece lens and f/2.2 aperture and an LED flash. On the front, the smartphone has a 5-megapixel camera with a three-piece lens. It comes with 16GB of inbuilt storage that is expandable via microSD card (up to 128GB). Connectivity options on the Panasonic Eluga I5 include 4G VoLTE, Wi-Fi 802.11 b/g/n, Bluetooth v4, FM radio, A-GPS, Micro-USB with OTG, and a 3.5mm audio jack. Sensors on board include an accelerometer, ambient light sensor, proximity sensor, and a proximity sensor. The handset also has a fingerprint sensor on the back of its metal body. Besides, it is powered by a 2500mAh battery that's a non-removable one, and measures 143x71x7.5mm along with a weight of 145.5 grams. Earlier this week, Panasonic officially launched the Eluga A4. The smartphone debuted at a price of Rs. 12,490, sporting a 5,000mAh battery.